The Walnut Valley Festival is one of the premier music events in the Midwest, and has brought national and international acoustic music superstars to its stages since 1972. The festival features all kinds of acoustic music, from bluegrass to folk to Americana, old-time country, cowboy and western swing, as well as Celtic and other traditional favorites, played on four main stages, providing festival-goers with over 200 hours of music. More than just stage acts, attendees have the chance to browse through an arts and crafts fair and enjoy a variety of food served by a legion of food stands. Take time to roam through the elaborate campsites, take part in impromptu campground jams, or watch an up-and-coming group perform on one of the campground stages. And take in one of 8 instrument contests, known for attracting some of the most talented musicians in the world, including the festival's flagship, the National Flat Pick Guitar Championship. 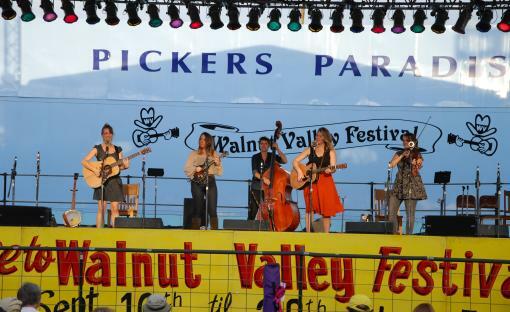 Held on the third weekend of September, the Walnut Valley Festival has something for everyone. Join thousands of people from all over the world who come together every year to celebrate acoustic music, renew old friendships, refresh their spirits and pass the music on.